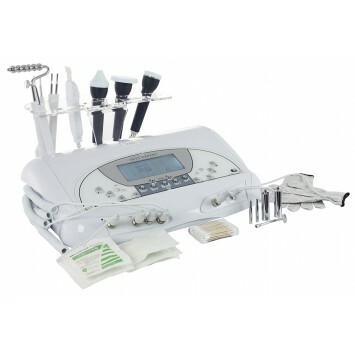 Micro Current Skin Lifting System - The Microcurrent Machine has two important functions during a facial treatment. Its main function is to introduce water-soluble products into the skin. When using Biowave, there are two poles, negative(-) and positive(+). Microcurrent enhances the ability of active molecules to penetrate the skin surface. Its benefits are wide and far-reaching: it increases the skin’s absorption capacity, minimizes wrinkles, and normalizes the skin. Step 1: Exfoliate – spray on organic toner or serum while skin is moist apply tip at 45 degree angle, in a downward motion move slowly all over face, you will see blackheads and skin cells blast off of face as well as collect on tip of device. Tip: lift the skin in blackhead areas with thumb and index finger ‘pinching’ the section to put more pressure under the blackheads. Step 2: Penetration/Muscle Toning: apply thin layer of serum or moisturizer flip the tip over hold flat on skin, move in an upward motion all over face it will vaporize your moisturizer creating tiny molecules easy for the skin to absorb. This action will heat and massage the skin stimulating more collagen and elastin growth, shown in independent studies. 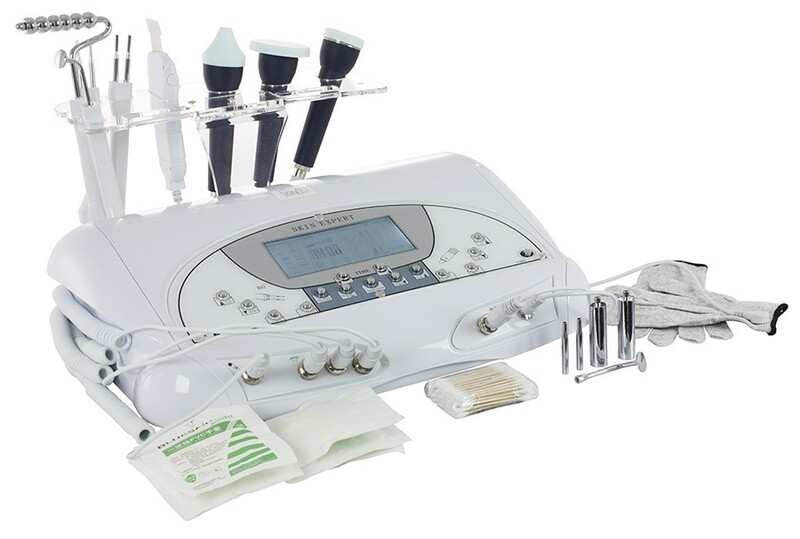 3 in 1 Facial Unit: Ultrasonic+Microcurrent+Skin Scrubber Micro Current Skin Lifting System - The Microcurrent Machine has two important functions during a facial treatment. Its main function is to introduce water-soluble products into the skin. When using Biowave, there are two poles, negative(-) and positive(+). Microcurrent enhances the ability of active molecules to penetrate the skin surface. Its benefits are wide and far-reaching: it increases the skin’s absorption capacity, minimizes wrinkles, and normalizes the skin. Two separate and equally valuable functions, easy to clean, daily use increases results without side effects or irritation, no expensive parts to replace, extracts more blackheads, improves collagen/elastin/skin firmness, massages/vaporizes product for deep penetration How To Use A Skin Scrubber Blade: Step 1: Exfoliate – spray on organic toner or serum while skin is moist apply tip at 45 degree angle, in a downward motion move slowly all over face, you will see blackheads and skin cells blast off of face as well as collect on tip of device. Tip: lift the skin in blackhead areas with thumb and index finger ‘pinching’ the section to put more pressure under the blackheads. Step 2: Penetration/Muscle Toning: apply thin layer of serum or moisturizer flip the tip over hold flat on skin, move in an upward motion all over face it will vaporize your moisturizer creating tiny molecules easy for the skin to absorb. 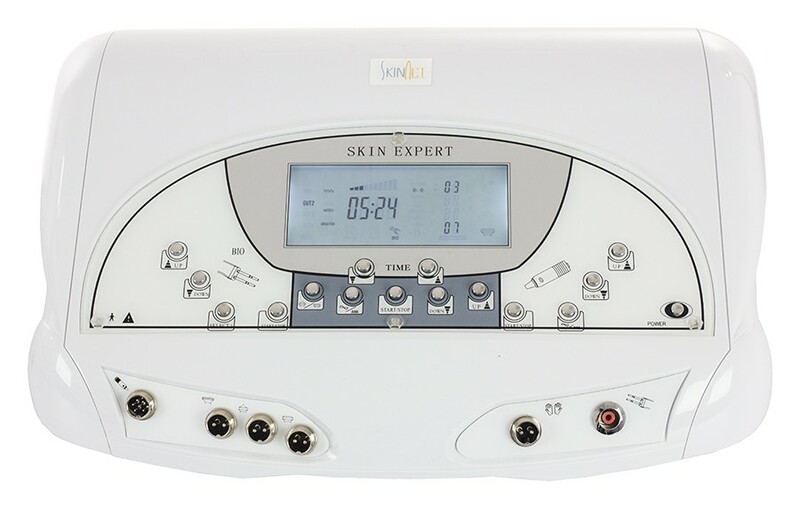 This action will heat and massage the skin stimulating more collagen and elastin growth, shown in independent studies.